The airway behind the tongue, called the posterior airway space, collapses due to muscular relaxation in some patients while they sleep. As a result, when taking a breath, the soft tissues of the airway either partially or completely collapse, thus obstructing the airway. A partial obstruction results in reduced airflow, known as hypopnoea and complete obstruction leads to cessation of airflow completely, known as apnoea. From the anatomical diagram below, the tongue falls back blocking off the airway. An oral splint can be worn to maintain the forward position of the lower jaw (mandible) and this helps to maintain tongue support preventing the collapse of the soft tissues closing off the posterior airway space. Such a splint is called a Mandibular Anterior-positioning Splint (MAS). 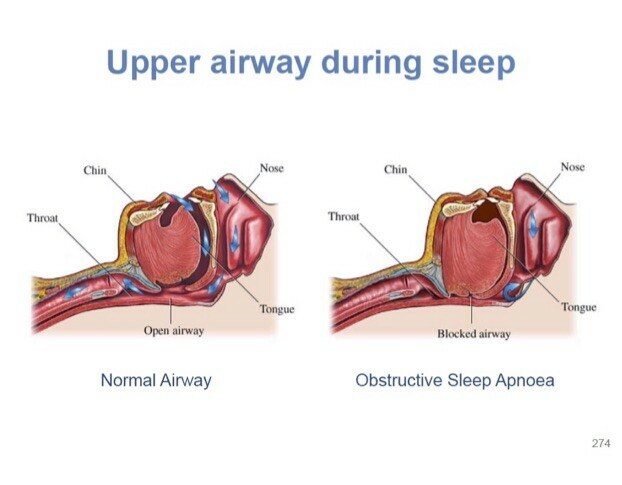 Patients suffering more severe OSA may require a continuous positive airway pressure (CPAP) machine to use at night. However patient acceptance with MAS is far higher than with CPAP. The X-rays show how on the left there is only a very narrow airway (4.25mm) while the lower front teeth remain behind the upper teeth in what is a normal position. In the X-ray on the right when the lower teeth are brought forward, the mandible that has the tongue attached to it, brings the tongue forward and in so doing, it opens up the space behind the tongue, (posterior airway space) increasing the space to 12mm. This is the basis of the success of the MAS as a treatment for OSA and snoring. With reduced, or cessation of breathing, the cells of the body quickly use up the available oxygen in the blood leading to a fall in the oxygen saturation of the blood and as a result an increase in the level of carbon dioxide carried in the blood occurs. Usually it is the small increases in carbon dioxide that drives the body to breathe. However if the airway is obstructed by soft tissue, breathing cannot take place and the patient‘s effort to try to breathe results in their becoming more awake, often waking with a feeling of panting, gasping or choking. This partial waking from sleep is described as an arousal and this lightening of sleep can lead to sudden complete wakefulness or simply result in a poorer quality of sleep. These regular arousals throughout the night result in inadequate rest for the body’s healing, repair and refreshment to take place. These periods of hypopnoea or apnoea can occur many times every hour and is measured by the sleep study as the Apnoeic Hypopnoeic Index (AHI). With repeated apnoea, sleep is so badly affected that patients fail to recharge their batteries at night and become increasingly tired, irritable and find they have very poor concentration during the day. An AHI of more then 30 per hour is considered severe. The most common symptom of OSA is snoring. Often patients who suffer from OSA snore very loudly and this can result in pressure being placed on personal relationships with the sufferer having to sleep in a separate bedroom. OSA can also result in the patient waking up feeling as if they are choking or gasping for air. OSA sufferers frequently perform erratic leg movements while asleep and may wriggle their legs constantly during the day, a condition known as “restless legs syndrome”. Patient with OSA often complain of daytime tiredness. They may fall asleep after lunch, when sitting reading, while in a cinema or other public place, even in front of the computer or when having a conversation. Some even fall asleep at the wheel when driving. 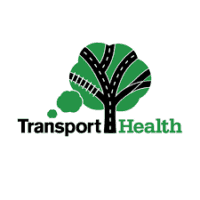 Research has shown that OSA sufferers are 4 times more likely to have a road accident than other people. People of all ages and both sexes can suffer from OSA. It can affect healthy fit individuals but more often affects obese middle-aged people, more commonly men. However, women after menopause are also frequently affected. The only reliable method of diagnosis is by means of a “sleep study”, also called “polysomnography”. This can be arranged in a sleep medicine laboratory or at home, both through referral to a sleep medicine specialist or through your GP. These studies can be performed with different levels of equipment from a level 1 study measuring every parameter to a level 2 study measuring a large number of parameters, both being conducted in a sleep laboratory. Level 3 and 4 studies can be arranged at home in your own bed, the latter often being more representative of the normal situation. Once the study has been completed and all the data collected digitally, it can be analysed by a sleep medicine specialist and a “polysomnography report” is written that will detail the severity of sleep disorder from which you are suffering. A questionnaire has been developed to help predict those patients most likely to suffer from OSA. The STOP-BANG questionnaire has been found to be effective. 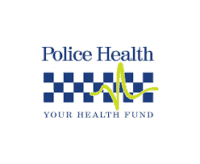 The letters STOP-BANG indicate the risk factors. 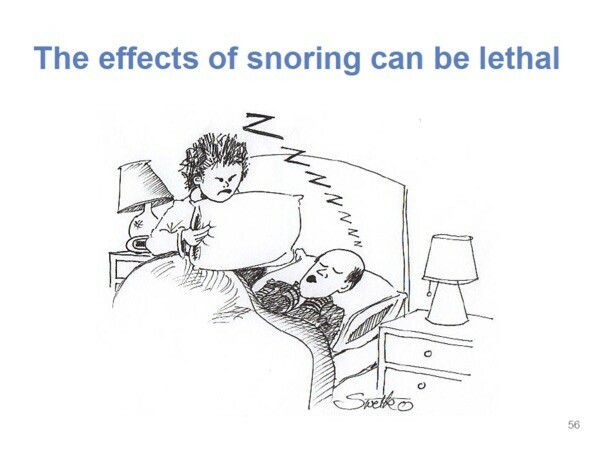 S Snore: Do you snore loudly? T Tired: Are you tired and sleepy during the day? O Observed: Has anyone observed you stop breathing when you sleep? P Pressure: Are you being treated for or do you suffer raised blood pressure? B BMI: Is your BMI over 35? A Age: Are you over 50 years old? N Neck circumference: Is your NC >40cm? G Gender: Are you male? If STOP-BANG is >3 then there is a high chance of OSA existing and if <3, OSA is unlikely. Often the first suggestion is for obese patients to try to loose weight. Even 10% reduction in body weight can have a profound effect on the degree of OSA or hypopnoea resulting in a 26% reduction in the respiratory disturbance index. However, weight loss is not always accompanied by reduced severity of OSA or snoring. Following weight loss, there are two ways to treat OSA. Historically, continuous positive airway pressure (CPAP) has been used. This relies on the patient tolerating one of a number of mask designs to cover either the nostrils alone, the entire nose or the nose and mouth, to allow air to be blown into the airway under positive pressure to inflate the airway to stop it collapsing. This works but many patients find the masks difficult or uncomfortable to wear and find they wake during the night with the mask not fitting correctly due to rolling onto the side and a noisy escape of air taking place. This results in poor acceptance in some patients. Over recent years oral devices have been developed to hold the lower jaw forward to a degree that reduces the tendency of the tongue to relax back against the posterior airway wall sealing off the airway. These oral appliances are called various names; most commonly they are referred to as mandibular anterior positioning splints (MAS), of which there are many designs. No single design is superior to all others. 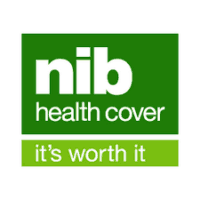 Many have benefits and may suit a particular patient. Many designs of MAS exist and a number work well in different patients, however for the best result, they must be custom made for the patient to achieve a stable fit ensuring the appliance cannot move on the teeth during the night. This is one of the main shortcomings of “over the counter” appliances that can be purchased from stores. They must also be adjustable allowing the degree of anterior positioning of the lower jaw to be accurately set to the point at which snoring and OSA cease. 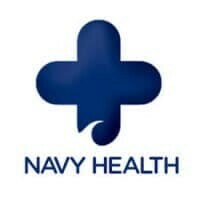 It is the latter point that is most essential from a health point of view. In contrast, those appliances bought from stores are generally not adjustable, another one of many shortcomings. Some science to back it up! A landmark research study clearly demonstrated that “state-of-the-art” oral appliances were overall equivalent to CPAP in terms of improving blood pressure, quality of life, sleepiness and the apnoeic-hypopnoeic index (AHI) and was considered superior to CPAP in 4 of 8 quality of life measurements (Craig et al. Health outcomes of CPAP versus oral appliance treatment for obstructive sleep apnoea. Am J Resp & Crit Care Med February 2013). This suggests that MAS should not only be used for patients suffering from mild to moderate OSA, and for those in the group suffering from severe OSA but who cannot use CPAP. The performance of MAS in the treatment of OSA in all patients should therefore be considered as good as CPAP and therefore suitable as a first line therapy equally as effective as CPAP. More recent research by Dr Carol Lang at the University of Adelaide has demonstrated a clear link between OSA and depression in men. Male OSA patients should be questioned regarding any experience of loss of interest in work, hobbies, family or increasing sadness. If there is any suspicion of depression they should be advised to speak to their GP. 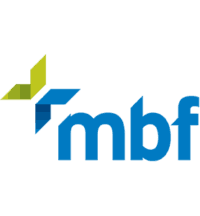 Another useful resource is the Beyond Blue website (beyondblue.org.au) which may be useful in helping them accept that they may need professional support. In order to reduce the chance of suffering from OSA, patients who have a tendency to snore should abstain from smoking, minimise alcohol intake, particularly in the evening, as this further relaxes the muscles and contributes to snoring and OSA. Similarly they should also avoid caffeine at night and avoid eating a large meal late in the evening. OSA patients should avoid taking sleeping tablets, but if they have been prescribed, then the GP must be involved in any decision to change your medication regime or discontinue any applicable medication. What possible side effects exist? Some people experience a change in the position of some of their teeth. This varies from patient to patient. These changes cannot be predicted and some changes can be undesirable but on questioning, patients considered these occlusal changes as acceptable in view of the positive results experienced in treating snoring and OSA. Temporo-mandibular disorder has also been reported in some patients wearing MAS. 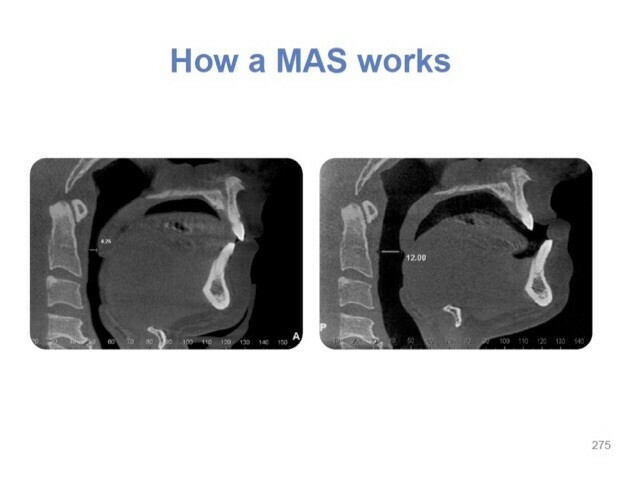 Approximately 12% of patient treated with MAS experienced this side effect (Dr Alan Lowe – Presentation at the Meeting of the American Academy of Dental Sleep Medicine 2007, Minneapolis, USA). This therefore supports the need for 6-12 monthly review of patients receiving treatment for OSA or snoring using MAS therapy.